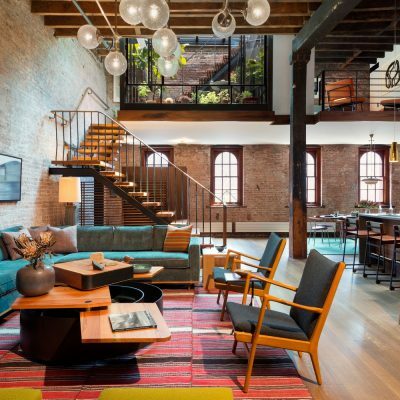 Located in a landmarked warehouse, the historic character and dynamic conditions of the existing project space were striking, featuring heavy timber columns and a unique geometry as a result of a sloped double height ceiling. 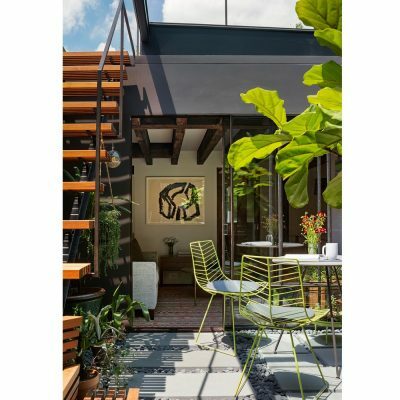 While celebrating the authentic loft character and history of the building, the goal was to create a light-filled home with a sense of calm and retreat; an oasis within the urban jungle, and incorporate links to the natural environment. 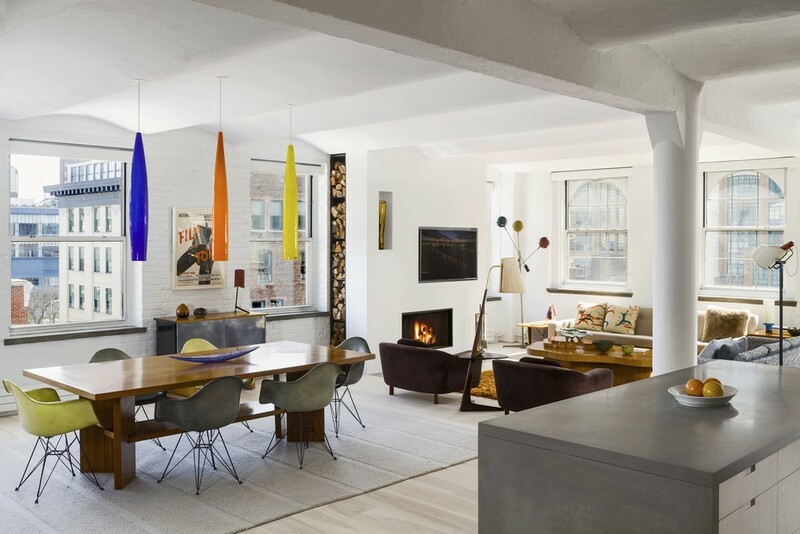 In an 1884 warehouse, the top floor and roof are reconceived as a warm and inviting residence with a fluid connection to the outdoors. The space is transformed by a relocated mezzanine which features an interior court with a retractable glass roof, and connects to the new green roof garden above. 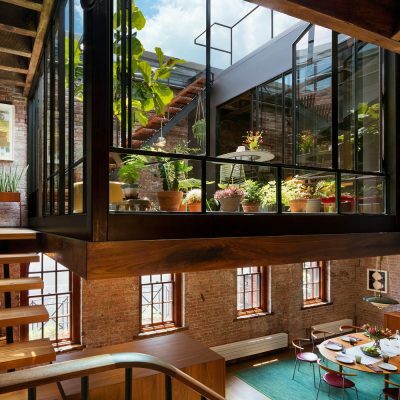 Embracing the industrial past of the building, a visual discourse between new and old is devised through insertions of modern materials along with restored or reclaimed materials from the loft. This project transforms a 280 m2 former commercial space into a modern and flexible home for living and entertaining. As you enter the loft you are presented with large entertainment areas and direct access to the mezzanine level. This transitional area features an interior court and a guest room suite, and connects to a roof garden with a lounge and dining area. The new floor plan contrasts the open, flexible living areas with private bedrooms and bathrooms in the rear of the loft. The design was guided with a goal of an eco-minded, healthy, and low-maintenance living environment. 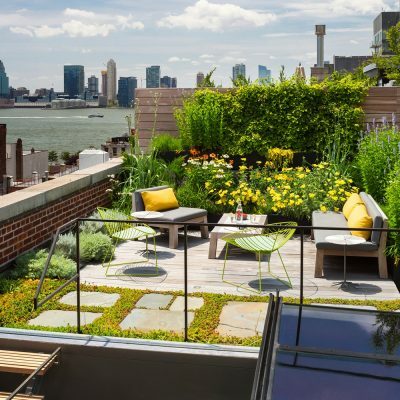 Reclaimed materials or locally sourced materials are used throughout, including wood floors and the oak for the cabinetry, baseboards and door frames, and reclaimed bluestone pavers on the roof top terrace. The green roof garden features a majority of native plant species that require little water while insulating the environment below. New ultra-efficient mechanical systems are employed. The project is located in New York City, in the landmarked Tribeca North area. 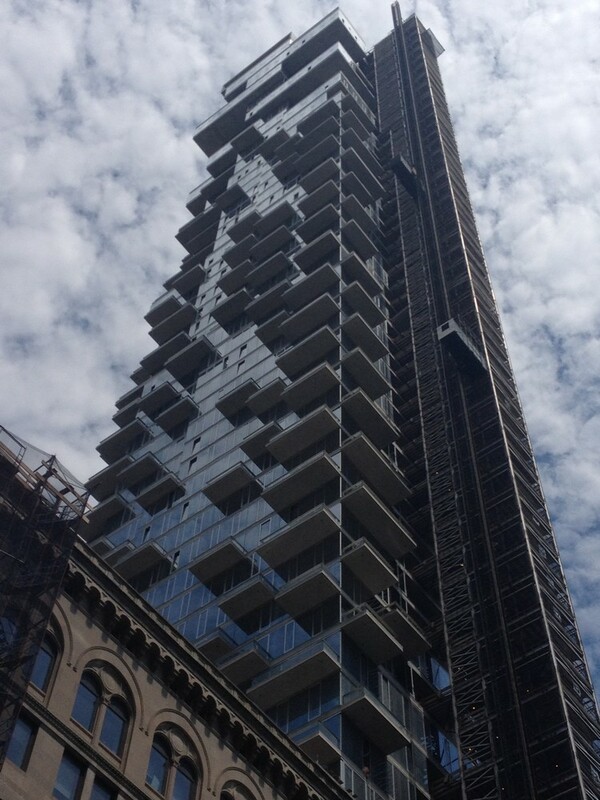 The design process started in July 2011 and construction was completed in July 2013. The are of the apartment is 280 m2. After thoroughly surveying the conditions of the site, including the history of the building, we worked closely with the client to fully understand their needs and user patterns and to develop a detailed scope and program. Seeking an innovative yet pragmatic design solutions, the team explored multiple options, considering program, site, and user experience and engaged with engineers and consultants early on to ensure building systems were fully considered and integrated into the design. 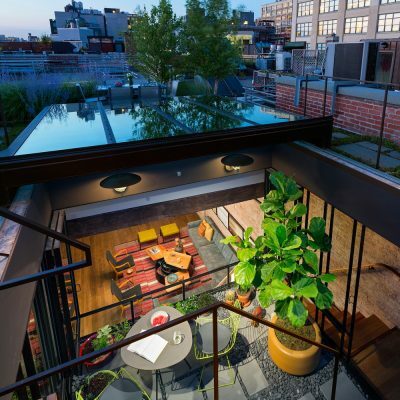 The main challenge was to add light, views, and outdoor connections within the constraints of a landmarked space. The existing loft was dark and cluttered, partly due to an existing mezzanine located below the ceiling’s lowest point. To open up the floor plan, we located the mezzanine at the south end where the ceiling height is greater. The added height allowed for the creation of an interior court which exposes the sky and brings light and accessible outdoor space into the loft below. General Contractor: ZZZ Carpentry, Inc.